The view in the field is a chaos of pigeons and doves that can test any shooter’s abilities and self-restraint. 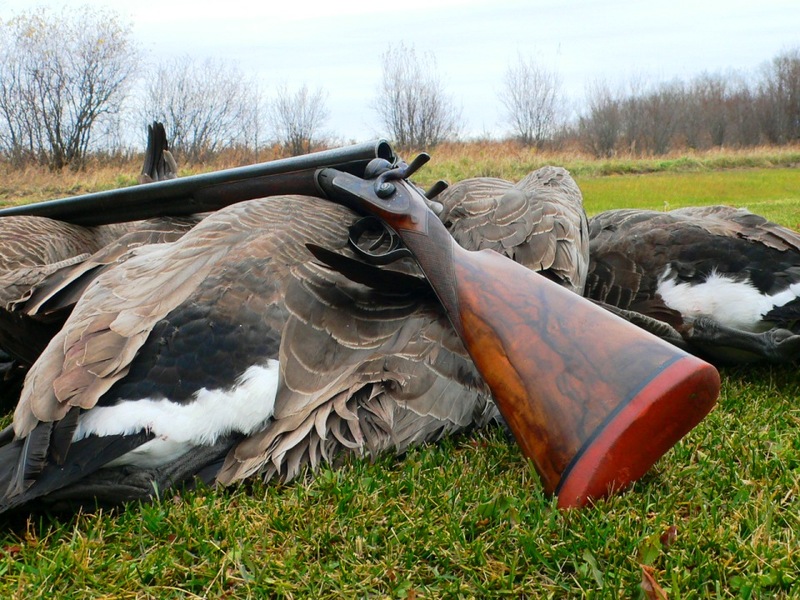 I chose the first bird that seemed ready to dip into the set from the streaming swarms and brought the gun to my shoulder. While I shifted peripheral vision to relaxed focus on a lead, la paloma jinked and dropped, flared, regained height on rapid wingbeats and sped on. The spiraling pigeon had broken the moment’s focus, leaving me to wave the mounted gun in silly arcs in a brain-freeze rush to keep up. After a couple of seconds I lowered the gun, unfired, and began watching for my next chance. Franco had done what he could to help—a pair of decoys on a spinning arm, a dozen more plastic bodies on stakes and the first palomas I’d shot arranged in life-like repose. Pigeons and doves streamed forth by untold thousands—over the fields and the decoys, over and around the stately tree upstream of us, over our blind and over the endless scrub that stretched behind us. I did not stop to fret over the one that got away. Instead I turned to face the current of oncoming birds to switch to pass-shooting for a while, which I found somewhat easier and more enjoyable. 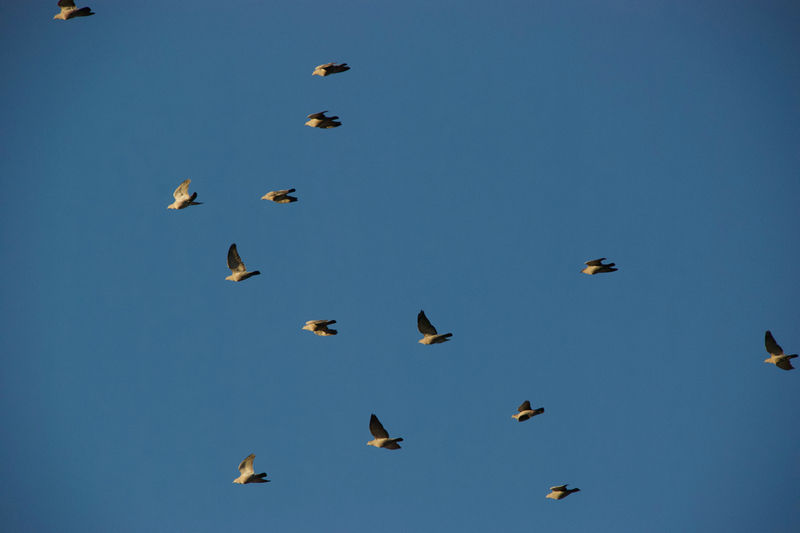 All morning long the spot-winged pigeons and eared doves came, intent on reaching the large dairy feedlots we had passed a mile or so from our shooting position. Franco knew that I wanted to shoot decoying pigeons because that is what I had asked of Ramiro de las Carreras, his employer, who began guiding wingshooters through his business, South Pioneers, more than 15 years ago. I had read plenty about the challenging shooting for wood pigeons in the UK and the picazuro pigeon of Paraguay. 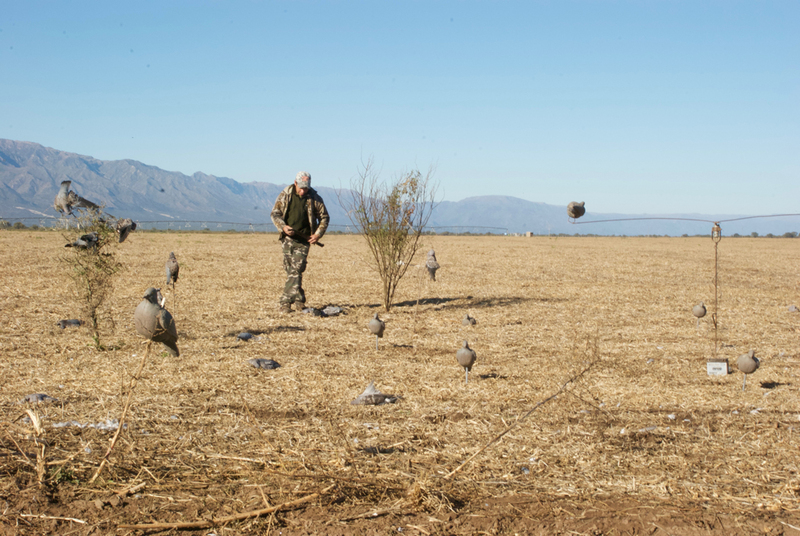 South Pioneers offers pigeons in volumes that can be experienced in few places in the world. Affable and an excellent host and conversationalist in English, Ramiro lives in Buenos Aires during the off-season and is an agricultural engineer by education and first career. That experience, he told me, led him to begin South Pioneers. 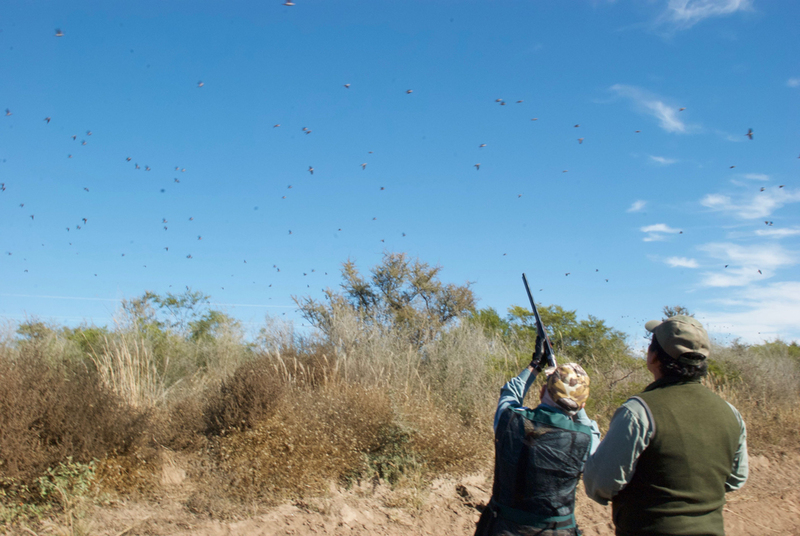 He saw an opportunity in San Luis Province, just west of the well-established dove shooting in Cordoba: as many doves as the croplands of Cordoba, with as many pigeons as Paraguay. I saw more doves than I recall having seen in Cordoba, and the pigeons were plentiful. A huge electricity-supply corridor running through the region created opportunity: It powers circle irrigation from deep wells on a scale that can be seen from space, creating a new agricultural frontier in the north of the semi-arid province. Ample sun fuels a year-round growing season, providing corn, sorghum, wheat, soy, alfalfa and even potatoes, much of it used to raise dairy and beef cattle nearby. It resembles the irrigated farmland of the American West surrounded by gently rolling plains of scrubland. Ramiro has arranged exclusive shooting access to more than 200,000 acres and has scouted the best locations across the seasons. For the birds, it is an all-you-can-eat oasis surrounded by a sea of roosting habitat. To say the pigeons and doves thrive risks the ridiculous. Try as I might that first day, I could not keep the pigeons out of the decoys, nor could I maintain the discipline of a self-imposed shell limit. An average shot, I fired 30 boxes of 20-gauge shells through a lodge Beretta during three hours each at my morning and afternoon locations. Despite the frustrating flight antics, so many opportunities allows one to shoot better quickly, honing in on range and lead and picking up on the birds’ lines. I took 304 pigeons and 159 doves that day, according to Franco’s count. (I’ll spare you the math: 62 percent.) I must have mounted the gun 1,000 times to fire 750 shells, losing my focus, my balance or my footing in that no-fire remainder. 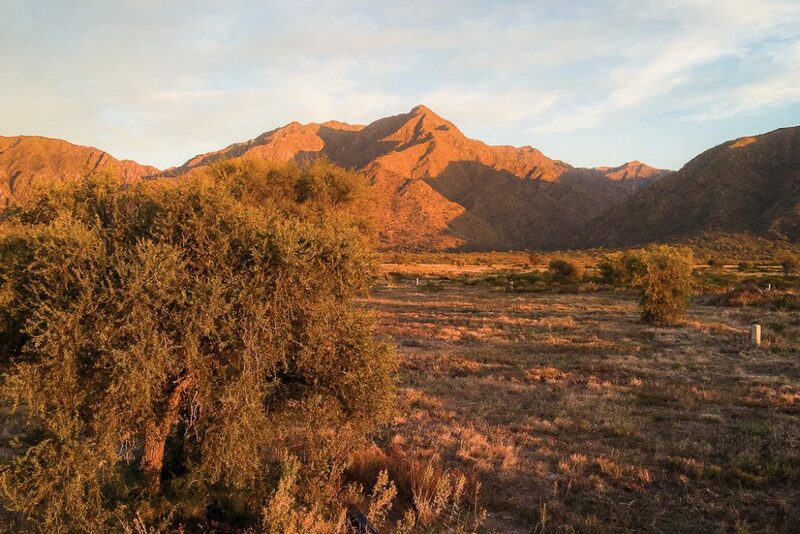 We were based at Ramiro’s Dos Plumas Lodge (Two Feathers—pigeon & dove), on the outskirts of the small town of Lujàn, at the foot of dramatic mountains that rise to the south and east. The lodge is newly built and opened in early 2015, with access through a manned gate intended to serve a future development of vacation homes. The location is quiet, save for the occasional dog barking or rooster crowing from the outskirts of town. The décor is tastefully modern, the rooms large and the staff genuinely warm and friendly. The food was fine cuisine but not pretentious or fussy. 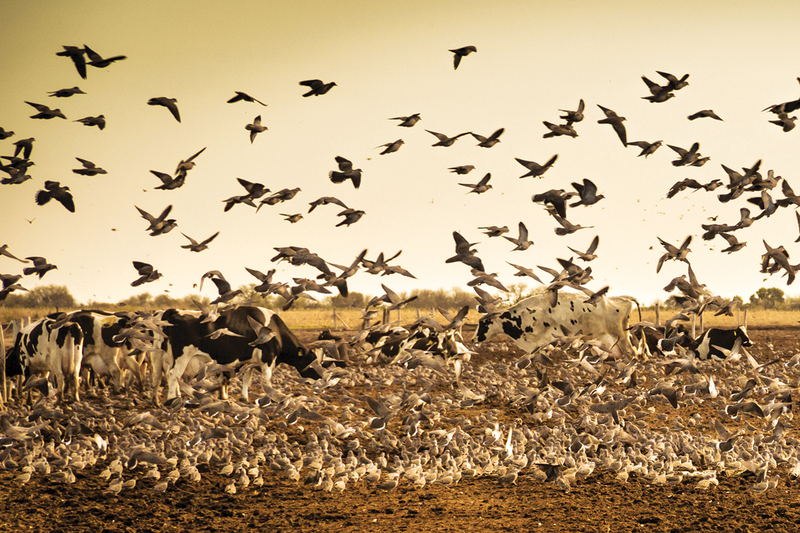 Drawn by irrigated croplands and feedlots—like at this dairy operation—pigeons and doves stream over shooters positioned along flightpaths. Franco takes a turn from our field blind. 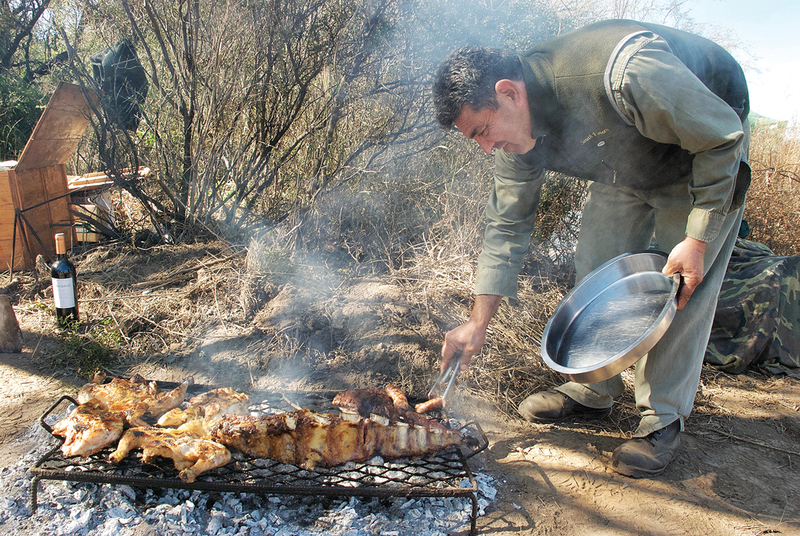 The field-lunch asado coming from the fire. 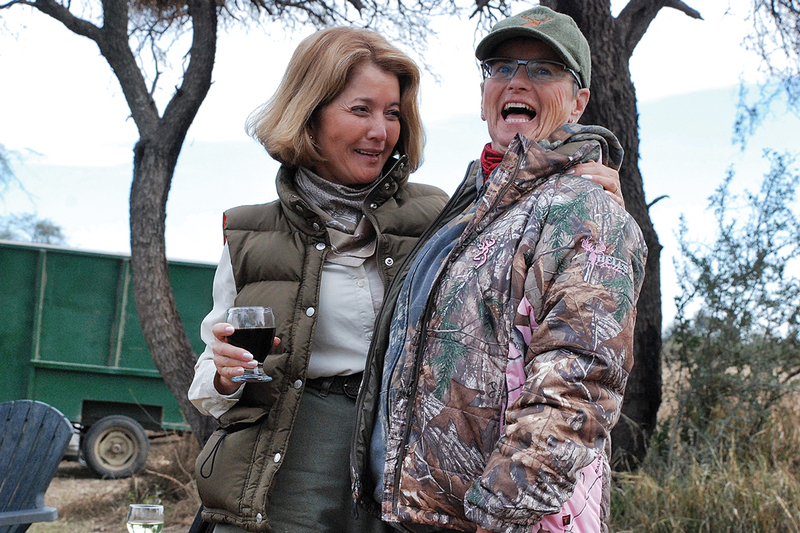 Vicky Cracchiolo (left) and Jane Webb enjoying the break between morning and afternoon in the field. Looking out from the lodge veranda in the morning sun. It all combined during my five-night stay for a comfortable, casual ambiance, as our group of five enjoyed trays of hors d’oeuvres before the crackling fireplace and four-course dinners served at the long dining table. Not every night at Dos Plumas was Argentinean wine and beef; we also ate local trout with caper butter and ratatouille, as well as ossobuco raviolis. For my four days of shooting in the first half of June, I shared the field with two couples—friends from Calgary, Alberta, and Southern California who had traveled internationally together before to hunt. John Woodcock and Jane Webb, of Calgary, took separate shooting stations in the field, while Andy Cracchiolo’s wife, Vicky, joined him in the field as an enthusiastic non-shooter. Ramiro and his team did an excellent job accommodating shooters’ preferences while also resting specific locations. On the first and third days, for example, we were about a 30-minute drive from the lodge and past the dairy operation; on the second and fourth days we drove 50 minutes and past beef cattle in fenced scrubland. On that first morning Ramiro more than delivered on the promise of decoying pigeons for Andy and me, while Jane and John shot more doves. Ramiro strives for a 50/50 mix of the species and consults with each shooter nightly. 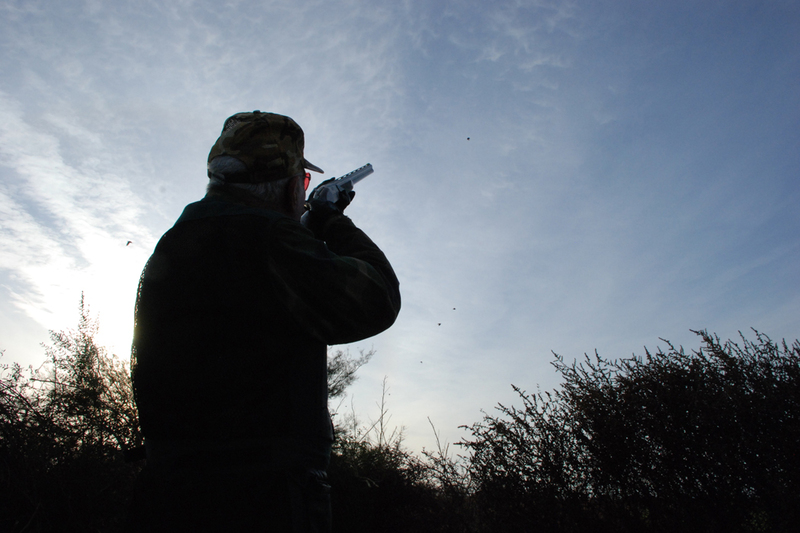 When Andy—a veteran of driven shooting in the UK—wanted the highest birds that could be presented, Ramiro and his field captain placed him and his bird boy, José, in a roadside swale facing a line of low trees and a stream of high incomers. 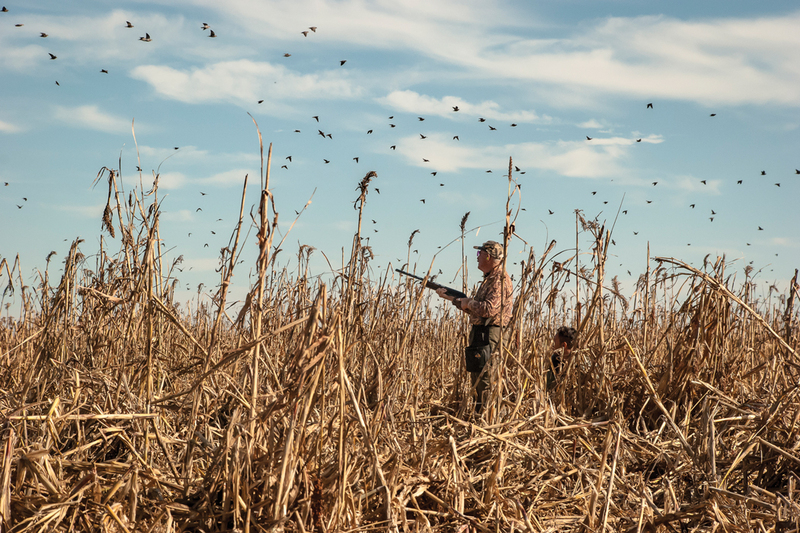 “Those birds were as high as any I’ve shot—anywhere,” Andy said after his second afternoon holding forth from this spot. Shooting positions were at least several hundred yards apart, and sometimes the van traveled more than a half-mile between us during drop-off and pick-up. Lunch in the field each day ranked well among life’s pleasures, served at shady sites a short drive from the shooting. The chance to get out of the sun, relax, have a cold drink and swap stories was a big part of it, and I thoroughly enjoyed my companions’ easygoing warmth and enthusiasm for the shooting. The guide crew would gather near the fire and field kitchen, enjoying much the same. 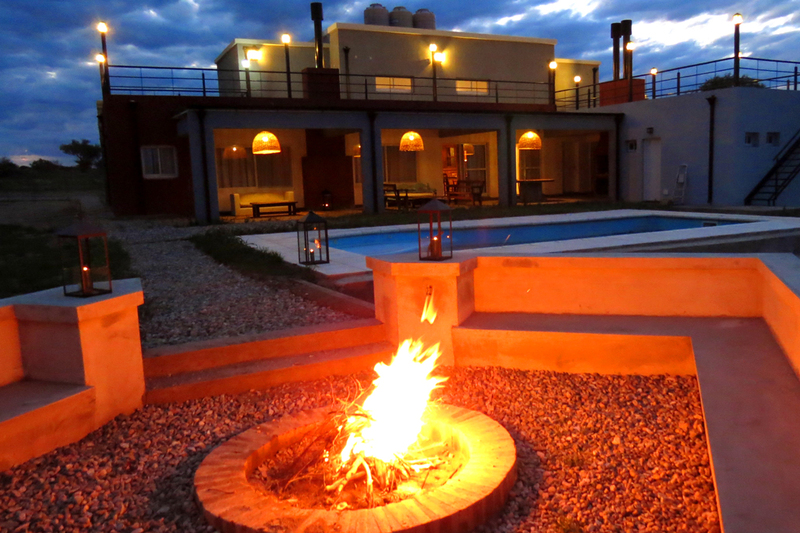 But the best was the woodsmoke and sizzling meats of the asado slowly finishing over the embers. Served under a tent with the door flap rolled open, we were treated to deliciously fresh green salads and other starters followed by everything from steaks and short ribs to sausages and grilled chicken—always in generous amounts and always with a chimichurri verde that was a revelation. No mystery here: Naps often followed, then coffee. The view from the lodge is of dramatic mountains and peace in the valley. I took a break from the endless shooting on day two to concentrate more on getting photos of the others. I find that in most outdoor pursuits I love—fly-fishing and skiing come to mind—watching others do these things well inspires me and makes the experience all the more enjoyable. And my group shot well, though they all claimed to be at their worst when I had my camera trained on them. Jane was a diminutive powerhouse in pink-tinged camo, swinging freely and easily from her station in standing, withered cornstalks, swatting doves in all directions. John showed amazing discipline among the waves of doves that darkened the sky, taking only the best shots, shooting exactly 500 shells on three of the four days (on the fourth succumbing to temptation and shooting 575), and hitting better than 90 percent on two days. Andy took on the greatest challenges he could find, targeting screamers past 50 yards and shooting one day with a 28-gauge Perazzi. Each shooter was very different, and each was a pleasure to watch. As even a blind squirrel is bound to find a nut now and again, by the third and fourth days I was in a groove. 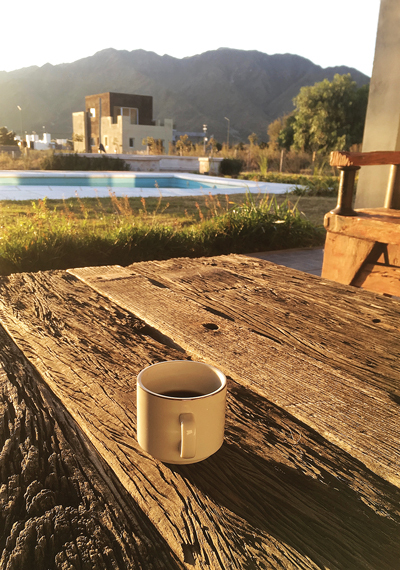 Franco and I had settled into an easy rhythm, despite the language barrier, and one morning after we each stayed up late watching a Copa Amèrica Cup soccer game, we laughed even more from giddy fatigue. I’d sit for a break, guzzle cold water and encourage Franco to shoot. A little reluctant at first, he took to it with a practiced eye if unpolished form—and he was very efficient with the shells. I have never shot better. I was routinely taking doves at 50 yards and more—choosing the bird, raising the gun, getting the lead, firing and watching the satisfying result pinwheel from the sky. “Muy alto!” I’d boast as Franco loaded the gun. I did not keep track of my success, but of course Franco did. On day four I shot 550 shells, with 69 percent success. A few more days and I might have become an above-average shot from sheer repetition. 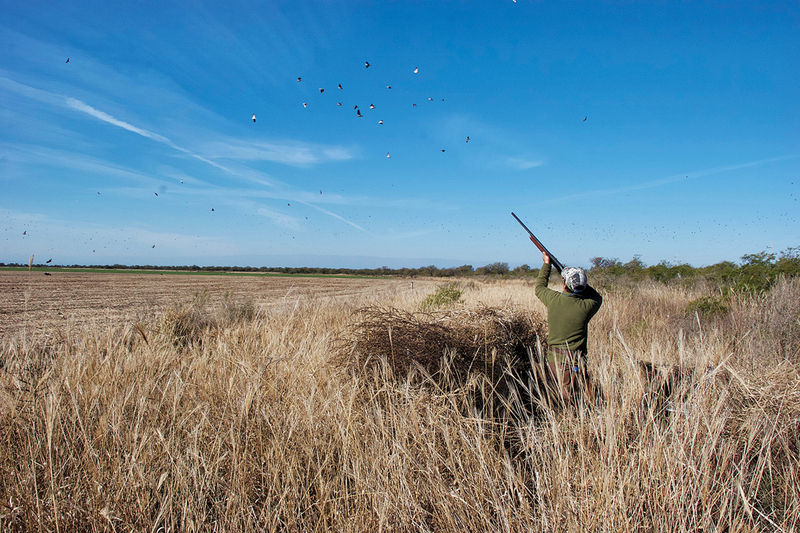 For more information on dove and pigeon shooting in Argentina, contact South Pioneers, 210-767-3383. Subscribe to Shooting Sportsman for $33. Swamp Magnum. The name alone strikes fear in the hearts of ducks and geese. As it should.